When Rachel Schofield Martin first took on the job of running her school’s cafeteria, one of her biggest challenges was distribution. She had the approval of her administration, the support of her school board, and the cooperation of her cook. She even had farmers nearby who were more than happy to sell her produce. What she didn’t have was a reliable way to get those carrots and onions from farm to cafeteria. During the early days of the program, Schofield Martin drove around to farms herself in the morning, picking up carrots and onions to bring back to her school, École Blanche-Bourgeois in Cocagne. It worked, but it wasn’t sustainable in the long term. It’s a problem that will probably sound familiar to many teachers, administrators and volunteers who are trying to bring more fresh and healthy food to students. Distribution is absolutely essential to local food systems – but it’s also “one of the hardest parts of the puzzle, really,” explains Kelsey Wilson, coordinator of Farm to School New Brunswick. Wilson was hired this fall as part of a joint effort by Farm to Cafeteria Canada and the New Brunswick Food Security Action Network to establish a provincial farm to school network. The provincial network is led by an advisory committee, including Schofield Martin. Eight schools in the province received grants of between eight and ten thousand dollars to develop cafeteria salad bars, stocked with produce from local farmers. All schools are also providing some kind of educational component: cooking classes, farm field trips, or greenhouse and garden facilities. This is the first time Farm to Cafeteria Canada has supported the development of a provincial Farm to School network in Atlantic Canada, says national manager Joanne Bays. We are drawing from the experiences of multiple regional organizations to create and link networks of Farm to School programming, policy and research across the country, says Bays. The work in New Brunswick is also a part of a Nourishing School Communities project, funded by the Canadian Partnership Against Cancer and Health Canada through the Coalition’s Linking Action & Science Prevention (CLASP) initiative. “Together we are amplifying efforts to get more healthy, local, and sustainable foods into students minds, onto their plates and into their tummies,” says Bays. In New Brunswick, explains Wilson, they’ve been fortunate to have been able to build on the work already going on in the province. Work like that of Le Réseau des cafétérias communautaires Inc. This is the organization that Schofield, with the help of many others, launched to expand the work that began at École Blanche-Bourgeois. In 2013 a co-operative of farmers in the region, Really Local Harvest, secured $168,000 in grants to create a subsidiary, Terroir Foods & Agrimarketing Inc., (TFA) which coordinates the sourcing and delivery of local food to the growing number of schools involved in Le Réseau. Comeau says the school will also be able to expand its horticulture program with the grant money, and aims to grow a few types of vegetables all year round. “Interest in offering healthier food in New Brunswick schools has been in the works for many years now,” says Roxana Atkinson, managing director of the New Brunswick Food Security Action Network. She points to Policy 7-11, which established standards for food options available in public schools, as well as the New Brunswick Nutrition Framework, a co-ordinated approach to promote good nutrition across the health-care system led by the provincial health department. Atkinson says that there were many projects that didn’t receive funding, but the establishment of a provincial network will look at ways to help connect them to information, partners across the province, and financial opportunities to get more projects started. 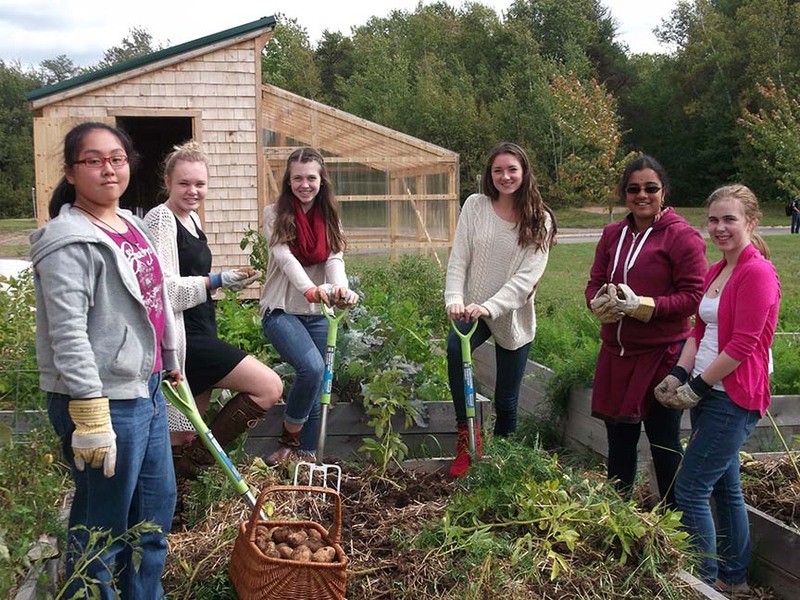 “Farm to School programs are emerging all across New Brunswick because they not only compliment these efforts to increase accessibility to healthier foods in schools, but also aim to support local economies and local food systems,” says Atkinson. This was a big focus of Farm to Cafeteria Canada’s efforts to build a Farm to School network in New Brunswick, as grantees were required to find farm partners. Last year, when the school’s food service provider, Chartwell’s, cut cafeteria service from four to three days a week, the school created a program called Fresh For You. That included a salad bar, a main course, an apple and a glass of milk. All the food, except for the apples, were from Costo, says Nicoll. Now, his farm partners provide salad greens, zucchini, cucumbers, bell peppers, cherry tomatoes, carrots and potatoes. The Fresh For You program has gone almost entirely local. The grant also provided some money to do field trips to these farms – another important aspect of the Farm to School program. Colleen Kimmett is a Vancouver-based journalist who writes about food policy.